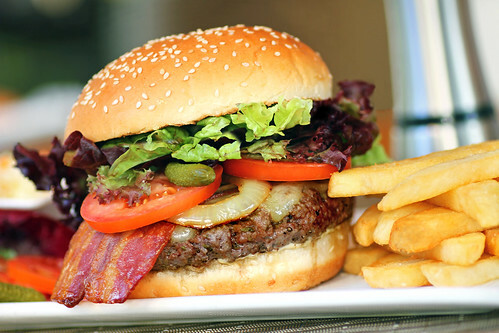 Hamburger with Cheese and Bacon, a photo by b80399 on Flickr. I am showing you an example of great food photography tonight as it demonstrates the struggle I am going to have with one of my new year's resolutions. During the week I have lovely healthy meals planned and am actually pretty much able to get my five-a-day but it's the weekend where it's going to go all wrong. We're always busy and seem to be having meals out, with friends or just on the run. For example yesterday we so busy we only had the chance to stop for a McDonald's and today we went out for a meal to celebrate a friend's birthday and I couldn't resist a big juicy burger. My philosophy is that if you are treating yourself to a meal out then you don't want to be pushing a lettuce leaf around a plate. As a side resolution perhaps I need to make weekends healthier too. Although I can't see myself not having a few juicy burgers like this once in a while. Now I will sit back and look at this fabulous photo as pictures don't have any calories. Mmm, just look at those perfectly done onions.